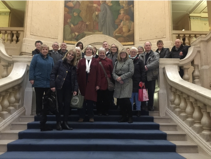 Discovering Nottingham and City Treasures proved so popular that this group was set up as well. We will be following similar visits plus some new ones. If anyone has any ideas of Hidden Gems to visit locally please get in touch with the group contact: Linda Rothwell on 07712 277962 or email lindarothwell@hotmail.com. Bill Saxton very kindly showed us a film show of old Nottingham at the Sun Inn at 11 am. It dated back to 1850 and was very interesting to see how things had changed over the years. It also gave us an insight of how people used to live from the North side of Nottingham to the South and what their customs were. There were many interesting old buildings that Nottingham City Council got rid of in the 1970s. This was such a shame because the old buildings were built to last and they were all part of Nottingham’s heritage. We were just left with concrete monstrosities such as the Primark building that replaced the Black Boy hotel. Also Garners Hill and Drury Hill buildings were demolished to build the concrete Broadmarsh shopping centre and bus station. As of 2019 The Broadmarsh is being redeveloped and hopefully planners will be able to put right the mess they made in the 1970s. Our slide show finished with different bridges which are around the Eastwood area and how they fit into the landscape. Bill finished the show at 12.30 and we were all extremely pleased at what he had produced. 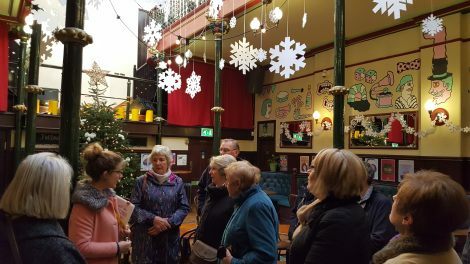 Twenty of us met at The Sun Inn at 10.30am to discuss what Hidden Gems was going to do in 2019. It was decided to keep the date the same that is fourth Thursday of the month unless it clashes with the National Trust trips. The meeting closed at 12 noon and then some of us went downstairs for an excellent meal to celebrate Christmas. We met our guide called Livia in the foyer to the theatre and she took us into the auditorium where we sat down to listen to her telling us about the background to the Playhouse. It was relocated to its present position in 1963 and is one of the England’s leading producing theatres in the country. Many of its production have been on tour around the country. The production that was just about to start when we visited was ‘The Madness of King George”. Backstage we were able to see the production rooms where the lavish scenery was being made. In one of the rooms we saw an artist who was working on magnificent curtains for the production. These entailed a lot of elaborate painting that several artists took it in turns to paint otherwise they would just be getting in the way of one other. We saw the extensive costumes they hold there in several rooms and some of them are stored In the wings just off the stage in order to have quick costume changes. In one costume room immediately below the stage there was a trap door in the ceiling to enable an actor to appear directly straight up onto the stage. This feature is quite often used for pantomimes. Off a long corridor which was decorated with pictures of famous actors who have performed there, were the dressing rooms. Each of these had a bed in to enable the actors to have a snooze. Doing two performances per day must be hard work and very tiring. We also began to appreciate the hard work all the backstage workers do. Preparing for a production such as the Madness of King George requires a lot of hard work from painters to furniture makers and costume makers. At the end of our tour we looked outside at the Sky mirror sculpture which was designed for the Playhouse by leading international artist Anish Kapoor and was erected in 2001, attached to a water feature. Finally we had lunch in the Playhouse café and as the weather was so good we sat outside and could admire the sculpture! On our visit we started off in the 19th century Court room where several of our group were asked to take part in a drama as the judge and witnesses. The foreman, the gaoler and the defendant were all actors. The defendant Emily was sentenced for petty thieving to be deported to Australia. After the drama we were invited to view a hanging but in the mean time we looked around the cells and saw various pieces of torturing equipment. We were able to read stories of real-life prisoners pinned up on the walls who had been at this prison. We bumped into Elizabeth Fry who was trying to reform the prisons and she was horrified to see that she had been replaced on bank notes today by Winston Churchill today!! After we had had a good look around we went out into the courtyard to watch a hanging. It turned out that is was Emily who we had seen earlier. The gaoler decided because she wouldn’t sleep with him he would hang her instead. After a lot of banter and booing from the crowd Elizabeth Fry arrived to save the day and the defendant was deported as originally planned. Evidently Emily met a wealthy man in Australia and married him and had a nice life! The tour was very interactive and informative. It also had a nice café in the centre of everything whereby we could eat and drink at our convenience. As this visit was in the middle of the summer holidays only a handful of us went to Skylarks in 3 cars. We listened to people who were making brooms and how they made them with materials around the reserve and we were asked to make one ourselves. We sampled drinks that had been made by fruit grown on the reserve and we were able to look at a range of binoculars for viewing wildlife over the lakes on the reserve. There were black sheep brought in to graze in a pen on the reserve plus lots of interesting short walks. Underneath the reserve the remains of Anglo Saxon houses have been found. These are being reconstructed above ground to form a very interactive Anglo Saxon Village. There were people in costumes informing us of how these houses were built and what life would have been like for them all those years ago. They were cooking food in an open fire place in the middle of one of the houses where the smoke went up to the ceiling and through slots in the roof – it was very smokey! As Skylarks is close to West Bridgford we found a tea room on Central Avenue to visit before coming home after our enjoyable visit. On one of the hottest days of the year 15 of us went to look at the Victoria Embankment including Turney’s Quay (former old leather works building). We were able to catch a bus very easily as they ran every few minutes from Beastmarket Hill, Nottingham and got off right outside Turney’s Quay. Turney’s Leather works was operating in the 19th Century making shoes and in the first world war it had an important role in making leather materials and clothing for the war effort. Today it has kept its original frontage with the Turney’s sign outside but inside has been transformed into luxurious apartments. The outbuildings of the factory have all been knocked down to make way for modern housing built around the canal and alongside the river. We walked down to the riverside alongside Turney’s Quay on the left hand side of the north side of Trent Bridge approached from the City. Opposite we could see Nottingham Forest Football Club, the 3 boat clubs called The Brit, The Boat and The Union. Next to these on the corner of the south side is a large white curve shaped building housing a hotel and Rushcliffe Borough Council offices. It was covered in scaffolding and looked as though it was being pulled down. In 1902 in the same place was a beautiful Empire style building looking similar to the Pavilion in Brighton. It housed many exhibitions but unfortunately this building burnt down in 1904. We then walked under Trent Bridge to the Victorian Embankment side and saw the flood mark levels showing the levels of the river over the years when there had been torrential rain. Today the Trent was very low. The embankment was called after Queen Victoria who died earlier in 1901 the same year it was opened. We walked further along the Victoria Embankment and talked about how people go there for leisure and boating compared to the early 20th Century when people would also swim in the river. Further down on the right we went in the Memorial gardens with plaques dedicated to soldiers of various wars. We saw the statue of Queen Victoria (which used to be in Nottingham’s Market Place), set in flowering gardens with seating at the back of the memorial. We crossed back over the road and then went across the suspension bridge built in 1906, which was revamped in 2008 after a fire. This foot bridge is made of wooden slats so the river can be seen beneath it. The rest is built of ashlar and steel and has twin dual steel suspension cables. As it is suspended the bridge can blow in strong winds. It has its original stone clad towers at either end and is a Grade II listed building. On the other side of the river we saw County Hall with its distinctive green roof which started off being copper coloured when built in 1947. The front is decorated by many statues depicting various workers and tradesmen. We then walked up the embankment to the south side of Trent Bridge and crossed the road to an Island where the remains of the old Trent Bridge (before 1901) which seemed tiny in comparison to the new. However it was interesting to note that the existing Trent Bridge was widen during the 20th Century to accommodate the increasing traffic. 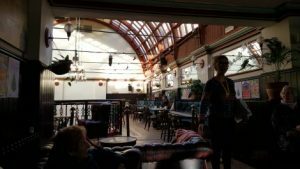 We looked at the world renowned Trent Bridge Inn which commemorates Trent Bridge Cricket, but, as it was a hot day we had lunch at the Town Arms which is right against the river. After lunch and our enjoyable trip we the caught the bus back to the City Centre. 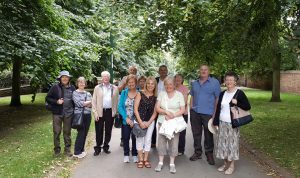 On 28th June, 16 of us went to look at a selection of trees at the Arboretum arriving there on the tram from Phoenix Park. We were very kindly led by Jim Crompton with input from Kath Crompton and Barbara Wigley. It was a boiling hot day but fortunately as the trees were in full bloom we managed to keep relatively cool under the overlap. The Arboretum was the first public park in Nottingham to be opened in 1852. It was developed by Nottingham Corporation to exhibit many wondrous trees and for people to promenade through them. It is now owned by Nottingham City Council Parks department. We followed the tree trail ranging from the Ginkgo Biloba to the Pterocarys Fraxinifolia; 36 trees in total on our tour. All leaflets on Tree trails are available from Nottingham City Council Information bureaux and the trees are colour coded and numbered to show the trees in your chosen walk. These walks in the leaflets indicate that they will take just over an hour to complete. At the end of our tour we went for refreshments in the newly refurbished cafe which used to be the lodge keepers gate house to the Arboretum. Although initially it looked small there was seating on two floors as well as seating in the shade outside where we sat. At the end of a good lunch we caught the tram just opposite the Arboretum back to Phoenix Park. 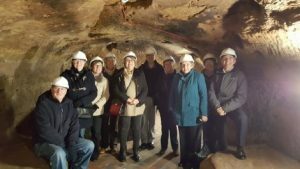 On the 24th May a group of 20 us went on a tour of the Watson Fothergill buildings in Nottingham City Centre. We were very kindly led by Margaret Naylor, Pat Collins, Denise Watts and Diana Pidgeon. Watson Fothergill was an architect who designed buildings in a gothic revival and Old English vernacular architectural style, dating from 1864 to 1912. We saw the site on Long Row where the impressive gothic style Black Boy Hotel stood were many famous people stayed until the 1960s. It is now the Primary Building which is an ugly concrete building. The only thing remaining of the lavishly designed hotel is a plaque on the wall! We looked at the Queens Chambers on Long Row/Queen Street and were able to admire the gothic design details on the buildings including a round tower and terracotta designs above the windows. There is also a stone carving of Queen Victoria up on the Queen Street side as Queen Victoria visited Nottingham about the time Queens chambers was built, hence the building being called the Queens Chambers. Also on King Street we viewed the Jessops’ buildings wonderful decorative details. Jessops become John Lewis and moved to the Victoria Centre in 1972. The original Jessops building now houses many restaurants were the decorative details still remain. On Parliament Street we viewed the old Express newspaper building which unfortunately had scaffolding around it. We could still see the decorative tiles around the doorway plus there is a plaque to commemorate the happy times the author Graham Green spent working there as a journalist around 1926. The building was completed in 1875 and the entrance doorway is in a gothic style and above is a round tower with a pointed roof. As this was a liberal newspaper there are heads of 3 prominent leaders including William Gladstone carved above the rounded arches of the doorway. Other tiles on the building were of Queen Victoria and Prince Albert that had appeared on Parliament Street before the building was designed by Watson Fothergill and he incorporated them in this building. Further along on Parliament Street we saw the building which once belonged to Farley and Co. where many different businesses were housed. Similarly to the Express building we saw decorative tiles adorning this gothic style building depicting the different trades that took place in this building. Onto Thurland Street we viewed the building of The Nottingham and Notts Bank and its decorative mortgage monkey. We viewed may of its original features before moving onto were the head office of Watson Fothergill used to be. This now houses the company Bravissimo and the manager let us go in to view the remaining original stone work and carvings that were distinctive of Watson Fothergill. Their Head Office was the last building on our tour of these distinctive buildings which can also be recognised by the initials WF. 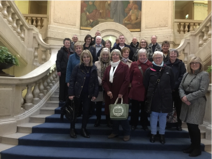 We thanked our guides for this impressive tour and as we were close to the Broadway theatre and cafe we went in and had an enjoyable lunch before we headed home. We started our walk on this showery day at the top gates of the 17 acre Arboretum. Barbara, who was leading the walk provided us with information and informed us that it was first opened in 1852 and was designed by Samuel Curtis.The Bandstand, which is grade II listed, came in 1881 when it was moved there from the Castle. The dahlia border is one of the longest in Europe but unfortunately none of the dahlias were out at this time of the year. Another flower to note in the Arboretum are the roses and there is a dedicated rose garden designed in 1972 to commemorate rose shows previously held there. We went under the subway which runs under Addison Street where echos can be heard. We walked back under the subway and looked at the statue of Feargus O’Connor who was a Chartist MP for Nottingham in the 19th Century. The Magnificent Chinese bell tower replica stands opposite and has 4 cannons at each corner. The original bell was captured during the 19th Century Opium wars and it was interesting to note that two of the replica canons were made in the Britannia Foundry in Nottingham. This replica was put in the Arboretum in 1956 and makes an excellent centre piece for that part of the Arboretum. We had a look at the ornamental pond which was one of the original features and filled by the water from St Ann’s reservoir. It has several ducks on it and many children and adults bring bread to feed them. Opposite the pond there is a large circular aviary which was built in 1892 . It houses cockatoos and one of the cockatoos that lived there who was called Cocky died in 1968 at the ripe old age of 114 and on the cage there is a plaque dedicated to him. Just inside, opposite the lower main gate of the Arboretum, there is a large statue of Albert Morley 1809-1886. He made his money in the hosiery trade and gave generously to the University, Nottingham High School, the General Hospital and public libraries. His statue was originally in Theatre Square but unfortunately damaged in transit. We then passed by the newly opened tea rooms in the listed Lodge keepers building at the lower entrance of the Arboretum and made our exit. We crossed the road towards the cemetery and saw more listed buildings . The Waverley Building being the old Nottingham School of Design in the 19-20th century. On the opposite corner there is what was known as Terrace Royal which were dedicated to the Royal family with a plaque outside commemorating the marriage of Edward, Prince of Wales and Princess Alexandra in 1863. Both of these buildings now belong to Nottingham Trent University. We then went into the general cemetery where many notable people of Nottingham are buried. These include John Player and Daft Smith Churchill. The latter has his own flights of steps up to his tomb. He had been a director of the Nottingham General Cemetery company. We came out of the cemetery through an archway in between a row of historic Alms houses and found ourselves opposite the John Borlace Warren pub where we went for lunch. Sir John was born in Nottingham and was a leading Royal navy officer, politician and diplomat. After lunch we went over the road to the Ropewalk and down steps, proceeding through a long tunnel which bought us into the Park area. This was a private way that the posh residents could get to their private lush estate. We decided to walk through the Park development to look at the properties there and on to Nottingham Castle. This bought us back to Friar Lane where we proceeded down to the Market Square where most of us went home on the tram. We all agreed what a wonderfully informative tour Barbara had given us. It was a clear bright day when 21 of use went to visit the magnificent tudor hall, built in 1588. I always thought that Wollaton Hall was just a visit to see stuffed birds/animals but on this tour we had chance to see the other fantastic rooms in the hall. Our guide met us in the hallway and talked about the Willoughby family who lived in the house. There were lots of interesting paintings of them in this room. He then led us to the Regency dining room which had original pieces in it from the 1800s. This room was very grand and we could imagine the elite people that would be sat around the table. It now houses little models of aspects of the hall and models of the people who lived there, placed on the table under see through domes setting individual scenes. We then went downstairs to the huge Tudor kitchen which had the original beehive shaped ovens and Tudor style wooden benches. These kitchens would have been extremely busy as used by the servants of the Willoughby family, cooking food (mainly meat) from scratch to serve above. This area of the house also housed the abattoir and the servants’ quarters. We then went down some more stairs and walked through brick dark tunnels which would have been the Willoughby’s wine cellars. We eventually came to a hole in the wall and through this we could see what is called The Admiral’s bath. This was a large water storage tank set way down into the rock. We were lucky enough to then go to the top of the house and the views were magnificent. As it was a clear day we could see from the balcony all the way to the Power Station near Castle Donnington. Situated at the very top above the great hall which housed the ballroom was the Prospect Room, accessed by a narrow spiral staircase. This was also used as a viewing gallery for when the weather is not good. The guide took us down to the shop for us to browse and we then left through the back door and made our way through the blooming gardens to the court yard where the horses would have been stabled and now houses the Industrial Museum. We then had a lovely meal in the café, which is also housed in the courtyard, before heading home after a very enjoyable trip. Fifteen of us met outside Bromley House on Angel Row at 10.30 and went up stairs to the library reception of this Grade II listed building. It has been an independent subscription library since 1816, formerly being on Carlton Street and at its present site since 1822. It was interesting to learn that in its early days the members were responsible for putting their own books back on the shelves no matter how high they were and were severely reprimanded if they were caught not doing so! Many classic books are available which can be leather bound on site. There is also a vast amount of paintings to be seen on the walls. The type of books and the paintings would not be found in a free library. We also saw the meridian line which is situated in a room where the sun shines directly in at 12 noon to a line on the floor. This is one of the few meridian lines in the country. It works by a shutter on the window with a hole in it projecting the sun light to the line on the floor pointing north south. In the attic we saw an old photographic studio. Local businessman Alfred Barber had seen great potential in the invention Daguerre introduced in the first camera producing permanent images and in 1841 he set up a photographic studio at Bromley House. The roof was altered so that a skylight containing blue glass could be fitted. The original camera is still fitted up and a chair is placed with a clamp fitted to hold a customers head still! Outside there is a lovely walled garden and there is a garden wing building which houses a reading room that looks over the garden. As it was February there were only winter blooms out. We all agreed it would be nice to go back to see the garden in full bloom in the summer. impressive council chamber which fortunately for us was free. There was an impressive throne like chair for the Mayor and our guide explained that due to the seating being in the semi-round that no body sits any more than 26ft from the Mayor who sits in front of a distinctive panel bearing latin inscriptions. The sounds in the chamber were helped by the 1930s seaweed panels on the walls also light switches that twist rather than being switched on were still in use. On the second floor we went in the very feminine sheriffs room. So called because its owner was a lady sheriff and unlike other rooms that had heavy wooden panelling this on e is decorated in Adams style in light green and gilt. Many of the rooms off the corridor could be hired out for weddings etc. They housed covered chairs with matching curtains and wooden type pulpits. These rooms also had luxuriously decorated pillars at various intervals on each side of the room. Then down to the first floor we went in the Mayors parlour which housed photographs of the Queen and Prince Philip who visited the council house in 1955. The signature book also contained famous signatures of visitors such as Tony Blair, Margaret Thatcher, Prince Charles and Princess Diana. We went in the vast ballroom onto the dining room where the Queen was also commemorated with a large oil painting of her on one wall. We also saw cabinets in the corridors that housed the mayors sceptre and cups celebrating big sporting events such as Nottingham Forest winning the European cup. Also we had a view of the Balcony where the Forest team would have paraded their wining cup and also where members of the royal family would have waved to the public. 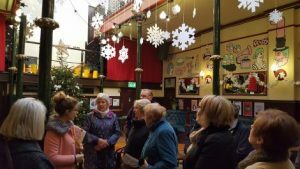 At the end of our visit we then came down the staircase towards the foyer and posed for a photograph underneath a portrait by Denham Davies about commercial history of the old exchange whereby trade was being conducted. Then back through the marble foyer with the mosaic coat of arms inlaid on the floor. We then ended our brilliantly enlightening visit after thanking our guide for a wonderful visit. Our visit on the 30th November was another dry adventure, unfortunately it was freezing cold so we did not venture outside for very long. The Malt Cross, previously called The Roebuck and originally an old pub on St. James’s Street, Nottingham but in 1877 the Malt Cross Music Hall was built. Now it is a Grade II listed building. It’s pièce de résistance is the roof, a masterpiece which is unique, being made of wood and glass panels. A balcony surrounds ironwork balustrades, from which customers could look down onto the small stage. On the ground floor there are panels of floor lights which allow light into the basement area – also unique. We explored further down into the caves where beer and wine etc were stored. Based at the Malt Cross are the Nottingham Street Pastors who amongst other charities are supported by The Malt Cross Trust, which was founded as a Christian charity in 2003 by a consortium of city centre churches who had a vision of improving Nottingham’s Night Life. Drop in for a coffee and food to support the charity and explore the amazing interior. The picture on the left shows the sewerage system. A group of 18 started off our walk at the Monument Gate into the Forest by looking at the Boer War memorial. The walk continued along Forest Road East past the Boys and Girls High Schools. They were founded respectively in 1513 by Dame Agnes Mellers after the death of her husband, and in 1875 by feminist reformers. At the top of North Sherwood Street we observed the overgrown exterior wall and door to the Jewish Cemetery, which opened in 1823 but its use was discontinued in 1860s. After crossing over the road to the Church Cemetery which was built on a former sand quarry in 1856, we saw the evidence of its origins seeping through the landscape, hence its other name “Rock” Cemetery. Barbara led us through a winding pathway of caves and rocks pointing out graves of well known Nottingham businessmen and dignitaries; including Sir Frank Bowden(Raleigh Cycles), Thomas Adams the lace manufacturer, the architects Watson Fothergill and T C Hine, and James Shipstone the brewer. We brought the walk to a conclusion at the Forest Lodge – a former Police/Keepers Lodge with its basement cell and the Enclosure Oak commemorating the 1845 Enclosure Act. We heard about the early sporting events held on the Forest and about subsequent improvements through lottery funding. Our walk finished at The Pavilion in the Homemade Café for well-earned cake and coffee (or for some giant cheese and ham toasties!!). The sky decided at this point to open, so we were all thankful to be inside with a hot cup of something in our hands. 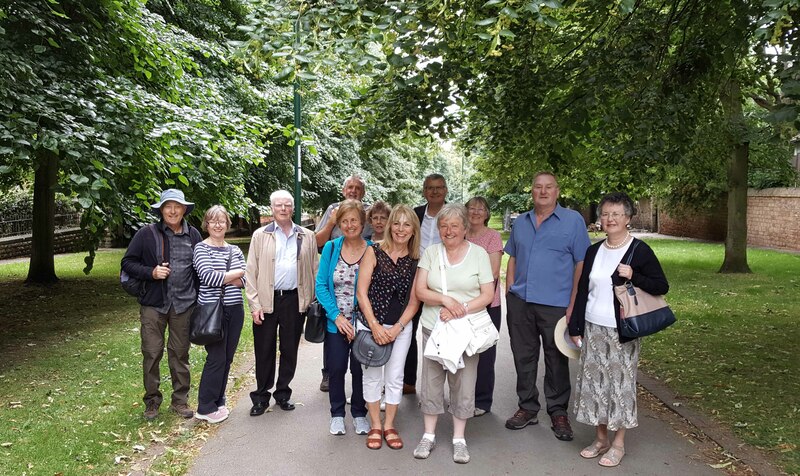 Yet another enjoyable walk in Nottingham, entertainingly led Barbara Wigley. The group met Len Marsh on a beautifully warm morning at the Lace Market Tram stop. Starting promptly Len led us on an interesting walk up to the windmill; passing through Hockley to Sneinton Market and then leading up Sneinton Road to Green’s Windmill. I was pleased to see new shops opening in the Market area and although ornamented by some impressive artistic graffiti it has not become derelict. At the windmill we met the miller Andy who gave us a full history of the windmill, its social context and its working. We also learnt how expensive any repairs were and how donations are important. We took coffee/tea and had our lunch plus a walk around the community garden. There is a science centre there which is mostly for children but still looked interesting with some video presentations which, if we had had more time, I would have watched. So after a group photograph we moved downhill to the nearby William Booth house and birthplace museum. Personally I thought this was an absolute jewel and coming after the guest speaker at Wednesday meeting was very fitting. We were met by Julie who gave a brief history of the family, the house and the progress of William from his teenage years. Inside the house(s) rooms were either dedicated to showing how life may have been lived there in those days, to a person(s), or the movement. Discussions about the house, the times, the people and the relationships between the families were very interesting and often enlightening. Although visiting two sites in one day seemed a lot beforehand, on the day I think we all thoroughly enjoyed it. Thanks again Len for a very enjoyable day. On a sunny Thursday morning we met with John Beech, our leader for the walk, outside the entrance to the Victoria Centre. The walk started from the corner of Parliament Street up to the junction with Forest Road and back into the city and viewing the Victoria Hotel (now the Hilton). John shared his intimate knowledge of the area and in particular his memories of when he grew up in the area as a child. In 1830 our starting point was actually the northern Boundary of the city. Passing the Victoria Station Hotel built in 1898, we viewed the Clock Tower. After a brief history of the station and the building of the Victoria Centre we moved through the Centre to the rear to view the cutting and the tunnel out of the station. It was then up Mansfield Road passing the Rose of England public house. After crossing Huntingdon Street, we admired a number of buildings and their architecture before entering Elm Avenue. On Elm Avenue apart from discussing its social context and architecture we had a wonderful view between the houses over Nottingham. The group photograph was taken here. After turning into Villa Road we were able to see the front of Hollygirt School buildings. At the junction with Forest Road we started our return journey, passing the Rock Cemetery and hearing about the gallows and the windmills which used to be along the ridge. After passing the plaque to Henry Dawson, a painter in the style of Turner, we admired the Blue Coat School buildings including statues in the side of it illustrating the then school uniform. After discussing the Mechanics Institute, Trinity Square and John’s recollections of ‘fights in the street outside the local ale houses’, we ended up back on the other side of the road from Victoria Station Hotel (The Hilton). 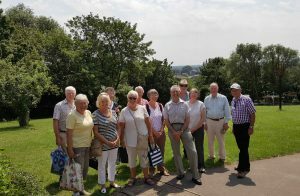 Twenty Members of Nottingham’s Hidden Gems group met outside Ropewalk House (Previously the Eye Hospital) to Meet Barbar Gani with her team of helpers Julie Arbuthnott, Pam Charity and Ron Madeley. After a brief introduction to the history of the hospital we proceeded to the site of the Casualty Department which is now Harts Restaurant. 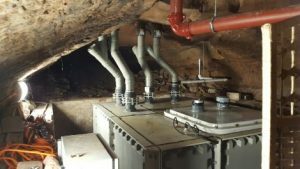 More details of the hospital’s history starting in 1781 were imparted to us, including some input from Deryck who had worked at the hospital himself, such as details of subterranean passages leading between parts of the hospital and even a nuclear incident. Moving along Park Row and into Postern Street past the circular wards and around to the oldest part of the hospital. In James Street we viewed the plaque to commemorate Lord Byron’s stay in 1798 at No. 76. Moving on down St. James Terrace we passed a plaque about the civil war and posts marking parish boundaries relating to the poor laws. Moving on we reached Standard Hill to view Memorial House, which used to be the nurses’ home but is now private accommodation. On King Charles St. we heard about the civil war and viewed a plaque to commemorate the raising of the king’s Standard. After viewing the house from Lenton Road we moved to the castle entrance where Ron gave us a history of the castle and then on to Robin Hood’s statue. From here we moved on to view Newdigate House in Castle Gate where Marshal Tallard had been detained after his defeat at the Battle of Blenheim in 1704. The Severn’s building around the corner on Castle Road looked interesting but having been a wine merchants its use was now unclear. A final destination was to the Trip to Jerusalem and Brewhouse Yard dating back to 1217 and is one of the oldest drinking establishments in England. We all enjoyed a sunny walk which was relaxed, informative and definitely scenic. Discovering Nottingham Walk 1 – Nottingham Arboretum, General Cemetery, Canning Circus and Park Tunnel. 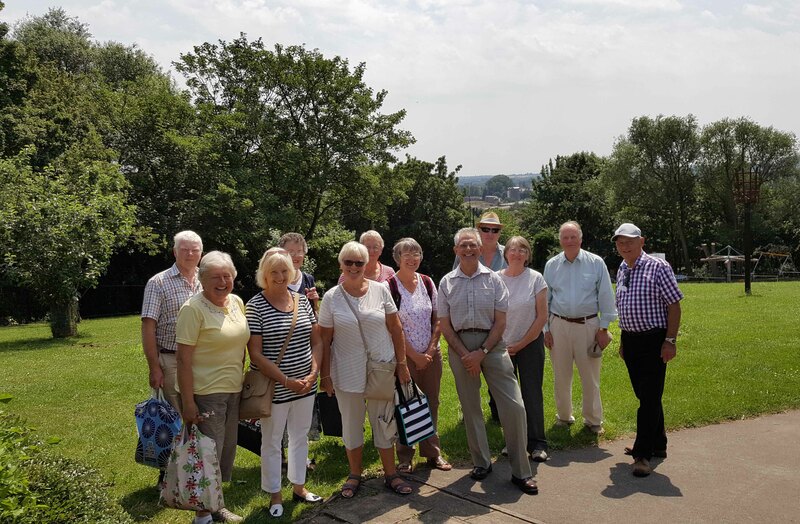 Thirteen members of this new group met Barbara and Audrey at 11.00 am by the Arboretum and did a walk round the various places of interest there – some of the members seeing the Chinese Bell Garden for the first time as well as various statues. We then looked at the Art School Building before crossing to Clarendon Street and the Terrace Royal (eight terraced houses with very fine stone carvings above the door ways etc). This is a “Hidden Gem” that none of the group had seen before! We then went round the General Cemetery and looked at the War Memorial and the plaque to Benjamin Mayo “The Old General” before ending at the grave of Daft Smith Churchill a Nottingham hosiery manufacturer who died in the ship wreck of the Forfarshire off the Farne Islands (of Grace Darling fame). We looked at Canning Circus and how it had changed over the years, from the time it was known as the Sandhills and site of three windmills, to 1895 when there was a horse trough, drinking fountain, public conveniences, cabmans shelter and weighing machine, to 1960s when traffic went round a traffic island full of tulips and wallflowers, to the one way system we have now. 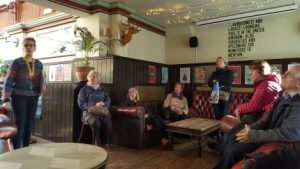 Everybody enjoyed a refreshment stop at the Sir John Borlace Warren pub and learnt about this Royal Navy Officer, Politician and Diplomat who had been born in Stapleford and was very popular locally, having various pubs named after him. We finished the walk at the Park Tunnel – another “gem” that many of the group had not seen before.